← Make IE prompt to remember password, again! There has been a hotfix available for this issue since at least 2013, so it was no surprise that i needed to download it. However, it did not immediately solve the problem. I had a varying number of messages on the Windows 8.1 Client about Version mismatch and the server having lost connection. I spent a good part of a day playing around, installing updates, removing the connector, adding the connector, even reinstalling the OS on the Client. Defeated, i decided to just leave the Server and Client running untouched for a day or so, (conveniently i was out of the office for a whole day anyway) and i came in this morning to see this. Whilst in one part of my mind i am pleased it is working, another, bigger, part of me wants to know what changed. 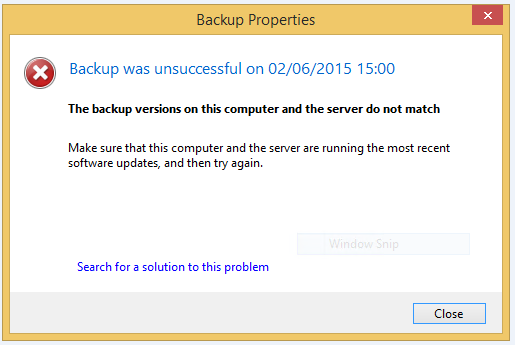 Nothing immediately stands out, the first successful backup was at 3am on the 3rd of June. Looking at the Server shows only a failed update on the third. 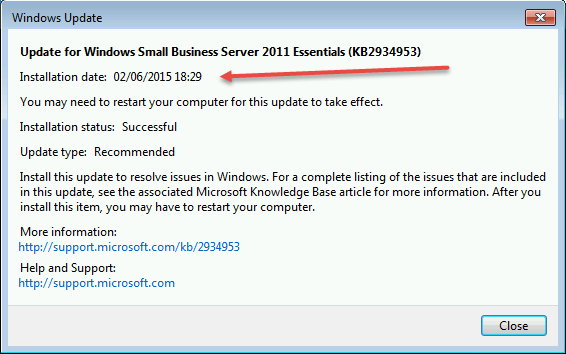 What was interesting was that the update, KB2934953 shows as having been installed at 18:29. About half an hour after i had left the office. This didn’t ring true with me because i recall installing that hotfix much earlier in the day. Indeed, reviewing the WindowsUpdate.log file reveals i did in fact install the hotfix 2781270 at 10:59. It took me some time to notice the difference in KB article numbers, and then work out the second update had been pushed out by my WSUS Server. So, it seems that two updates are now required to fully resolve the issue, and whilst this may not be news to some Essentials Administrators it had certainly passed me by, that or i had forgotten. In any case writing it up seems to be the sensible thing for this forgetful IT Pro.